There is a ton of new information about Inuit, Eskimo, Greenland, kayak design, different boats, different rolls and then I came upon something that links me back to an amazing movie, Atanarjuat or Fast Runner in English. 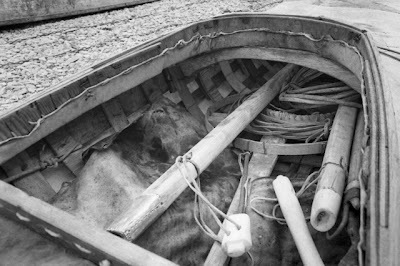 On the web site, there is this boat; a reproduction of Qajaq. "In the film, Atanarjuat paddles to shore in this qajaq (one-man canoe), toward his summer camp and his wife Atuat, who is now expecting their son. The qajaq was re-constructed by John MacDonald of the Igloolik Research Institute based on detailed structural drawings of a qajaq in the Inuit collection at the British Museum. The drawing, by Michael Morgan, was paid for by Morton and Estelle Sosland. 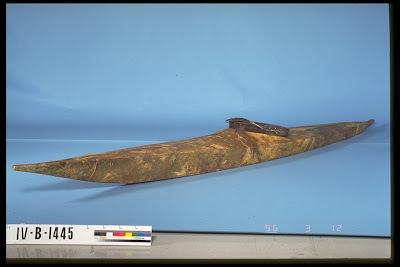 The qajaq in the museum is almost 200 years old and actually comes from the region of Igloolik, taken to England by the Parry Expedition of 1822-23. The original structure consists of a whalebone frame and a skin-covering attached with braided sinew." Then, that leads to this other page at Canadian Museum page with three boats. They are unlike most skin kayaks. Puzzled, searching long and hard leads to another page of a blog which feels more like bridge to the bygone time. Michael is the connection to the past who lived with Inuits and lives out in the arctics in the summer. He blogs in his site, Canadian Kayaker. And he has this picture of chasing a caribou and losing him in the chase. See this article by Michael. Here are pictures of skinny qajaq he lost and found recently. Voila moment, Inuits made these skinny Qajaq to chase caribou through water. For them, kayak was a tool. Fat kayak may be good for harpooning seals. 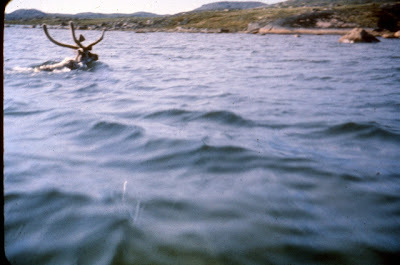 Skinny ones would be good going after fast moving caribou, apparently they are good paddlers (hoofers). It started from frustration of traveling in Asia. Land transportation creates scenes of roadside ugliness and transitory experiences. Having used Lonely Planet starting from their first edition of how to smuggle yourself from the Western Europe to Kathmandoo via Iran, much of my traveling became a chess game of how to exploit well beaten paths' infrastructure to remote and unspoiled areas. This game got me to places remote and so remote that a broken ankle could be life-threatening. But overall, that did not do it for me. Do the math. It takes you three weeks to set up logistics learn local supplies and language. Approach can take from three days to a week. You spend a month hauling with minimal support. So I got into kayaking. Load your kayak up with minimal gears; a bivy sack, sleeping bag and pad, trail mix and enough water. You have an epic journey mere half an hour from your launch spot. You come back with a cavernous hunger. Pei from the club is in Japan and sent a message mentioning possibility of a sister club. Masanori, a Japanese friend, is showing up in New York and we will attempt to make a kayak. 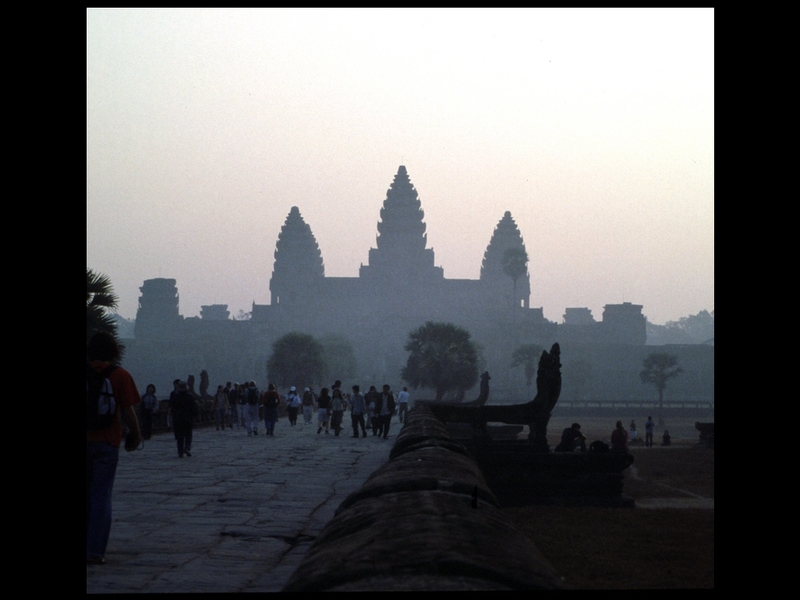 That got me dreaming about Asia again. Random walk lands me here and there on the Internet. I come across Jeff Allen's "Paddle Japan" They spent six months padding and compressed into a single page. Everyone talks about circling terra firma. You can make a circle with a kayak and you just have circle-navigated the world. Since I figure this out first, I will call it "Chalu's circle." Japan has Qajaq site. This sort of forces me to think priorities through; fun first or obsession first. Bragging rights aside, obsession is like a jar with a hole at the bottom. More obsessed, less filling. We are putting a forward stroke clinic together. In Jamaica Bay, there is a weird local spot where currents and winds converge to create wild wave patterns. Discussing with Joe Glickman, it is decidedly Asian in flavor. "Steadying yourself on that body of water takes good stroke technique. ", he says. "Tis like Zen", I say. "It is Zen", he says. My list of destinations is long; Halong Bay in Vietnam, paddling down Mekong, Ton Le Sap of Cambodia, Kanya Kumari of South India, crossing from Korea to Japan to South Korea, water around Sri Lanka, Madagasca. That gets me thinking; we need a ring of fellows or kayak zen masters dispersed around the world... Good and Evil. Marcus Demuth recently circled Ireland among other kayak exploits. He is known for long journeys. He uses Werner paddle. something I did not see mentioned, which is for me the #1 paddling/forward stroke think to know about an efficient forward stroke is the leg work. Push damn hard with your right leg against the footrest while making a stroke on your right, and same on the left side. In my world, the forward stroke happens to 60% inside the boat, and under the spray skirt (the leg work), and 40% is positioning of blade, body rotation, etc. Marcus pointed out Eric Stiller's article from Mayor's Cup site. The one thing I have done primarily right is to establish a fully body (foot to fingertip), torso rotating forward stroke. A stroke that continually evolves but is about 90% now. While I was aware of leg drive and torso rotation for about 20 + years, I was very happy to find the book "The Baron Mold” written by his coach and filled with excellent information and decent photos. I highly recommend you get a copy of it and EPIC kayaks DVD called "The Forward Stroke". 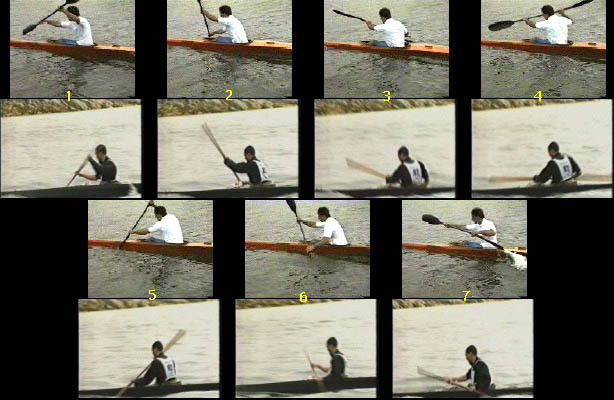 I have described high level sprint or marathon kayaking as hitting a T-shot with every stroke whereas the face of the paddle has a particular angle , connecting to the water at a particular speed , with a smooth delivery and follow through that is nearly as precise as hitting a golf ball with the face of driving club when done optimally. Greg Barton has one of, if not the most efficient stroke among Olympic paddlers in paddling history. Once you establish this "high" gear you will be able to apply the basic mechanics to many different paddle angles for different distances, speeds, and conditions (like changing gears on a bicycle but the crankshaft stays the same. 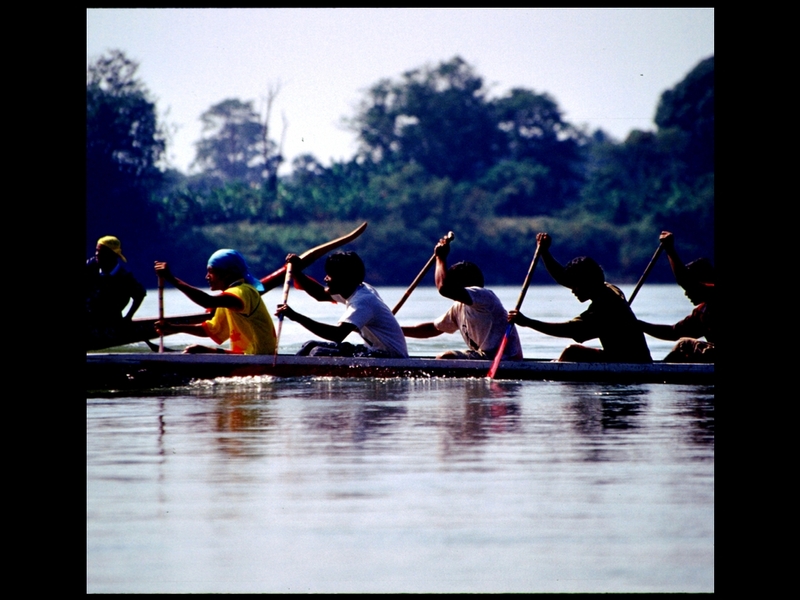 Technique is 70% of the paddling performance equation and all the strength, stamina, endurance, flexibility, speed, and power training only fills in the 30%. (Good Equipment fit is given in this equation). A person with exceptional technique and moderate "fitness" will generally out perform and person with mediocre technique and high fitness. Race speed, its cadence and the higher blade pressures put very specific demands on the body’s architecture. My torso could turn forever but the Triceps could keep up, hence a 5-10% loss of boat speed for the last 12 miles. I had compounded this discrepancy by taking out my 212cm Epic Wing Sprint Blade for the event and joked to Greg Barton and Joe Glickman as they passed me (could I trade you for a "mid wing") a paddle with a smaller blade face. The added pressure per blade connection was not conducive to a race of this distance. Bonnie of Frogma mentioned her blog entry "Of Paddles and Planes"
Your hands are an extension of your body," says Oscar Chalupsky. "If your body is stiff your balance is compromised. The key is to relax your body; move with the water, not against it. When in Hawaii, make like a hula dancer and roll your hips with the bumps." Says Gardiner: "Experience is the best teacher of all. When the wind is blowing, force yourself to go out and get used to chop. Make sure you go with a partner, tether your paddle to your boat and paddle along the coast in case you flip. "At the end of the day," says Chalupsky, "your technique will see you through the difficult conditions. The rougher the sea, the more you must concentrate on your style. Make sure you sit up straight. While you still want to concentrate on proper shoulder rotation, dropping your hands will lower your center of gravity and improve your balance. In addition, make sure you use to legs to keep yourself firmly in the kayak and to transfer your power into the boat. The key is to not let your speed drop off. The slower you go the less stable you are." "Too many beginners," says Gardiner, "try and surf across a wave. The key is to take off perpendicular to a wave and drop straight down the face. Once you have the speed you can track across the wave and look for another run. Always try and keep your bow pointed down. To do that, scan the sea for holes in front of you and paddle towards them." "There's a tendency," says Chalupsky, to go way off course when you're chasing the runs. Beware at all times of your final destination. This doesn't mean you have to track a straight line. You don't. But you need to keep your speed up and turn towards your destination while you're using the speed of the wave. That sounds simple but it's easy to lose sight of where you're going." A wing paddle must be moving sideways, away from the boat in order to function properly. This is the main difference between a wing paddle stroke and a traditional stroke. With a traditional stroke (dashed line below), the paddle is pulled relatively straight back during the stroke. With a wing paddle (solid line) the stroke begins with the paddle next to the side of the kayak, but then the paddle moves steadily away from the boat during the stroke. The stroke generally finishes 12"-18" further away from the boat than it started. Because the wing paddle is an open wing section (concave on the bottom side), water pressure builds up on the 'lip' at the leading edge of the blade and helps to push the paddle away from the kayak during the stroke. Therefore a wing paddle naturally wants to take the correct path in the water. It is best to pull straight on the paddle without forcing it into or away from the boat, letting the paddle move out on its' own. It will take a while to get used to the feel of the paddle and stroke; but once you find it, the stroke will feel very stable and comfortable. When switching back to a standard paddle, most wing users encounter a lot of flutter, as the traditional paddles do not track nearly as solidly as a wing blade in the water. The paddle moves outward during the stroke and then exits out to the side. To begin your push for the stroke on the opposite side, do not move your hand close to your head (this would require bending your arm significantly). Instead, start your top hand push wide (away from the body where your previous stroke ended), and slowly come across with your top hand as you push forward. Towards the end of the stroke, your top hand will cross the center of the boat. This is desirable - as your blade and bottom hand move away from the kayak, your top hand should cross over this same amount. The angle of the paddle shaft when viewed from the front should remain nearly constant during the power phase of the stroke. This series of articles is related to the forward stroke clinic by Joe Glickman. This is to help kayakers better understand elements and variables contributing to forward stroke. Looking at masters, it is hard to learn because they seem flawless. Dissecting their behaviors and movements and comparing notes would be just as good as learning from master. Go and be one with water and waves.. The catch is that there are many variables. By the time, we have clinic and you can contribute better understanding of how these variables play. So study and practice your strokes. Ask away at the clinic. For those who are armchair kayaking, here is a reading material written by our guruji, Joe Glickman. I read pages and it is a great fun book. I know I am putting Joe on pedestal. Enjoy it. This picture compares wing paddle and greenland. You see surf ski switching and extending legs transmitting power from leg over to shoulder. Green lander enters his paddle closer and takes shorter stroke. He does little stomach crunches and shoves the boat. This picture shows side view. "Below is a comparison of a wing paddle forward stroke and the Greenland forward stroke. These are not completely comparable strokes as the Greenland paddle is doing a long distance race, and the wing paddle is sprinting. The most noticable difference is the wing paddler slices his paddle out to the side in the water (Flared Stroke) where the Greenland paddler appears to pull more straight back. The Greenland paddle pushes the upper hand down across the boat, where the wing paddler pushes the upper hand horizontally across at eye level. In both cases the stroke starts out with the upper hand at nearly eye level. 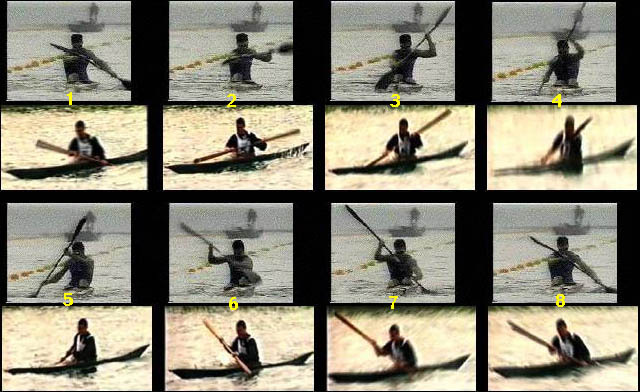 Here you can see that both paddlers use significant torso rotation. It is quite noticable that the wing paddle crosses over the boat with his hands held high, and the Greenland paddler crosses over with hands held low. 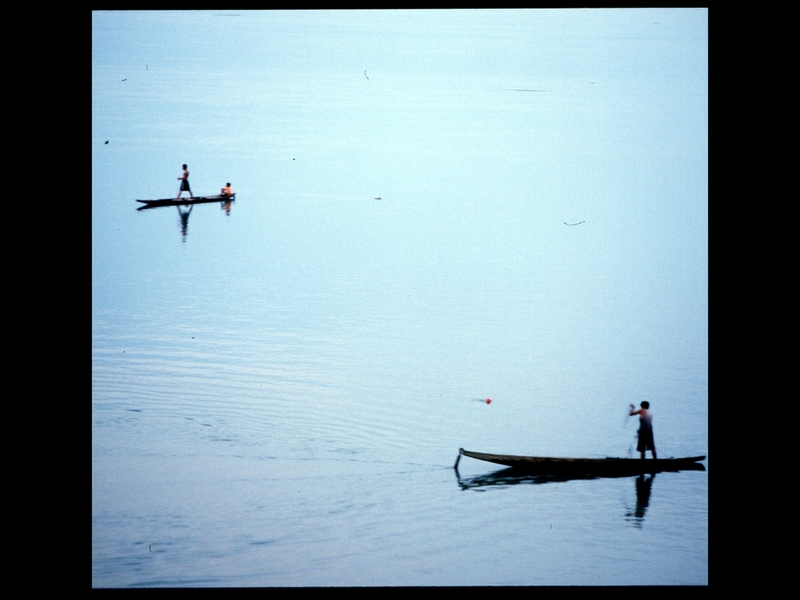 Some of these differences may be attributed to the different kind of paddling they are doing. As you increase your stroke rate it helps to have a more vertical stroke. I have found that having the upper hand cross the centre line of the kayak at the beginning of the stroke keeps the blade in a more vertical position and forces good torso rotation. This is virtually the only cause of paddle movement, arm movement being restricted to giuding the paddle out from the boat (or rather allowing the paddle to find its own optimum direction through the water). For longer distance paddling, it is helpful to have a more horizontal stroke. Varying between sometimes more vertical and sometimes more horizontal allows better muscle recovery for longer distance trips. 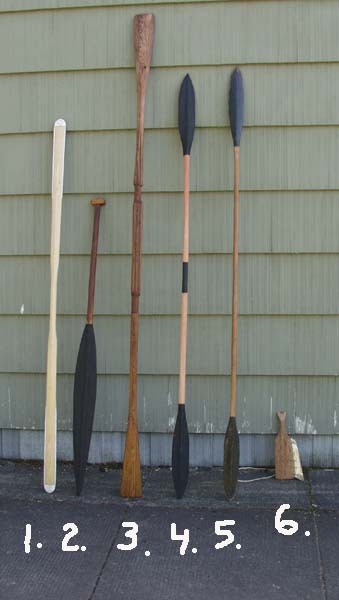 Also note the differences in paddle size and shape. This influences the path the paddle takes through the water and which position is most efficient." Philippe Castagner sent an interesting article which was forwarded to me about greenland paddle. There are multiple sources of this paddling techniques not just from Maligiaq. It goes to tell you wing paddle might be inspired by greenland. 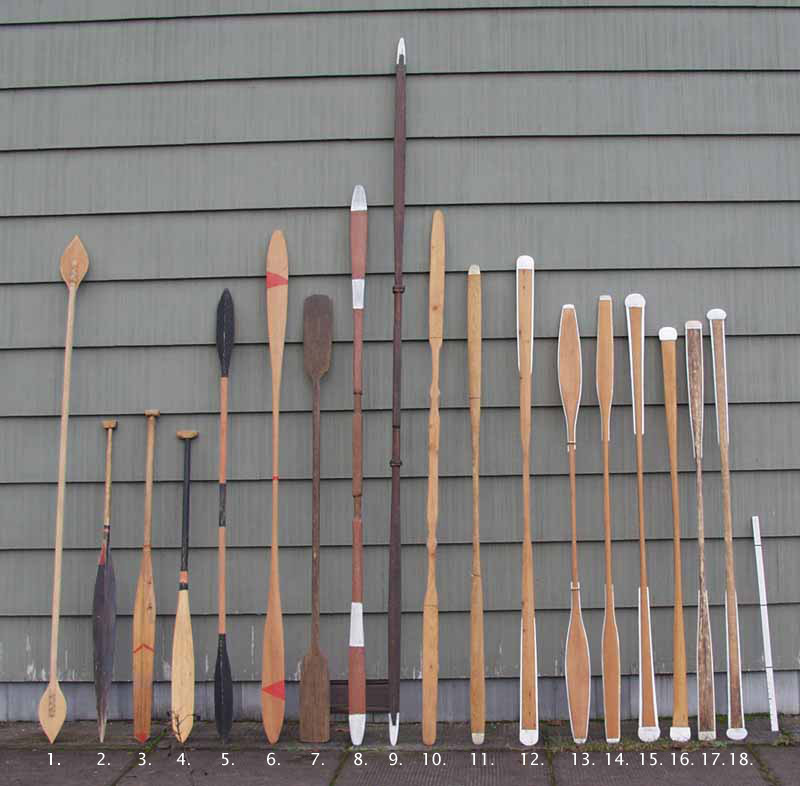 For long distance paddling (> 20 miles), one could develop a different type of paddle. In this instance, greenland paddle acts like wing paddle; bit of bracing and getting ready for the sweet spot. Power Phase. Maligiaq does not display as much side-to-side torso rotation as compared to an experienced paddler using the recreational stroke. Instead his pushing hand starts from just below the tip of his shoulder and is levered downward toward the deck, crossing just over the centerline of the kayak. His spine rises slightly and drops down in concert with his arm motion. His elbows stay fairly close to his sides. Viewed from the back, he looks like a boxer making slow motion, downward punches on alternating sides of his foredeck. Maligiaq's paddle shaft was held at approximately a 45-degree angle for normal cruising, higher than the paddles of the surrounding students and instructors (Note - this is the angle between the paddle shaft and the horizon, please don't confuse this shaft angle with the forward tilt of the blade discussed earlier).